President Trump slammed Oprah Winfrey on Sunday as “very insecure” after she held a voter roundtable on “60 Minutes” that touched on topics including his fitness for office. “Just watched a very insecure Oprah Winfrey, who at one point I knew very well, interview a panel of people on 60 Minutes. The questions were biased and slanted, the facts incorrect. 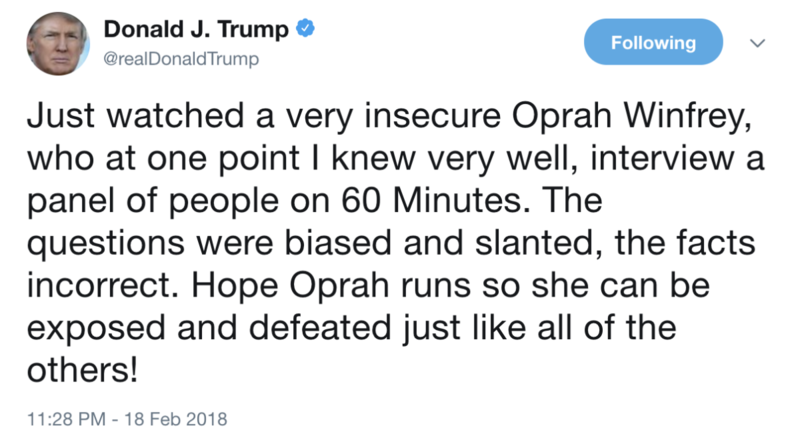 Hope Oprah runs so she can be exposed and defeated just like all of the others!” Trump wrote on Twitter. Oprah raised a number of sensitive topics for the president during the roundtable with 14 Michigan voters, which was a follow-up to a similar roundtable held last fall. The talk show host brought up the sexual harassment allegations against the president, as well as questions about his fitness for office and the “shithole” comment he reportedly made about African countries. “There have been some members of Congress, including Republicans, questioning his stability and fitness for office. What do you think of that, and do you believe he has the temperament to be president?” Oprah asked. She also brought up the infamous “Access Hollywood” tape that emerged during the 2016 campaign, revealing Trump making lewd comments about his behavior towards women. “One person who hasn’t been touched by the [#MeToo] movement is the president himself. During the campaign, we are all aware that some 20 women accused him of inappropriate sexual behavior. There was the Access Hollywood tape of course. What do you all think about that?” she asked. While discussing the “shithole” controversy, Oprah challenged one voter who said the president was criticizing the countries, but not the people from those countries. “Come on, Matt. If you’re talking about… Matt, if you’re talking about the country, you’re talking about the people in the country. When he’s talking about Norway or Norwegians, he’s talking about Norwegians,” Oprah said. “Sometimes I think Trump, just met with Norway and that was the first thing he thought of, ’cause, he said some things that are weird,” Matt replied. Oprah was briefly rumored to be considering a run for president in 2020, although she has since said that she isn’t interested.